In an effort to curb the so-called "white pollution" ubiquitous across China, the Chinese government is banning the production and distribution of plastic shopping bags thinner than 0.025 millimeters thick as of June 1. 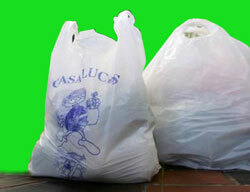 Currently the Chinese people use and discard some 3 billion such bags every day. Analysts estimate the ban could save as much as 37 million barrels of oil currently used to make the disposable bags. The Chinese website Taobao.com reports that since the ban was announced last week, more than a million reusable cloth bags have been sold by various Chinese online merchants. And local environmental groups are promoting and distributing cloth bags in schools across China. Meanwhile, the country’s largest plastic shopping bag producer, Huaqiang, shut down operations entirely. Critics point out that other large and complicated environmental initiatives have foundered in China because of difficulty orchestrating nationwide compliance along with widespread resistance to inconvenience at the local level. Also, some are questioning whether the alternatives to thin plastic bags are really any better for the environment if people do not take steps to discard them properly. Once the ban is in effect, China will join Bangladesh and Ireland in foregoing thin plastic bags for the sake of the environment. A similar ban is already in effect in the city of San Francisco, but industry backlash has made bans in other U.S. cities difficult to enact.